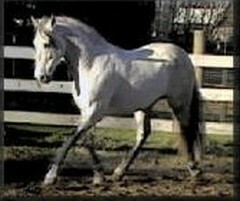 The decision to cross the Friesian with the PRE (Andalusian) came to the Classical Sporthorse Stud in the early 1990's. It was a joint dream between ourselves and our trainer "Senor Ramon Benitez Guererro" who was from the Spanish Riding School in Jerez, Spain. 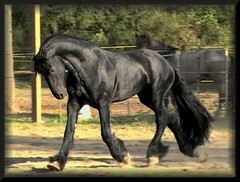 Ramon had been training high school PRE's most of his life, his love and respect for the breed was deep. 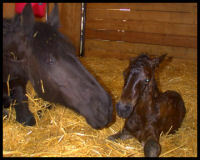 After the purchase of our first purebred Friesian stallion in 1992, we all saw the promise of a "super horse" from the crossing of these two breeds. 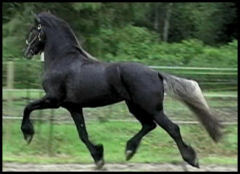 Crossbreeding of the Friesian horse in Australia was very common and many of the types produced were good, but in our mind by adding the flexibility in the joints and ease of ride of the PRE, this would be the ultimate cross.